A new analysis on western wildfires by Climate Central released Sept. 18 found that blazes seen this summer are now seven times more likely to occur than they were 70 years ago because of a continued warming trend, researchers say.Though devastating blazes that affected many parts of the state this summer are linked to a streak of hot weather, it’s more difficult to link them definitively to global warming.Assembling 40 years of fire data from the U.S. Forest Service, the study found fires larger than 1,000 acres burned twice as often each year in the past decade than in an average year in the 1970s.”Our analysis of fires on U.S. Forest Service land documents a clear, long-term trend toward more frequent and larger fires in the American West,” said Alyson Kenward, principle author from the Climate Central.The link of warmer, earlier springs and longer summers make conditions ripe for larger and more numerous, destructive fires, the study found.The study provided a sobering outlook on the new average burn season, which are now two and a half times longer than 40 years ago, adding approximately 75 days to the fire season each year.Across the West, spring snowmelt has come one to four weeks earlier than averages in the 1970s. 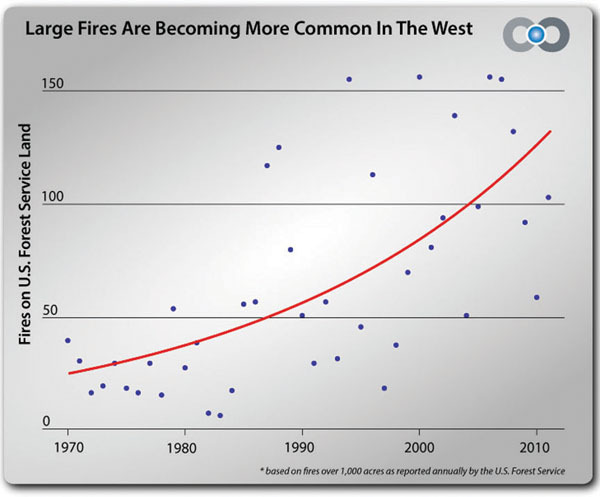 Since then, years with the most acres burned have been during years with above-average temperatures.”America’s western forests now see seven times more very large fires over 10,000 acres in an average year,” Kenward said. “Over that time, temperatures have increased dramatically.””In the not-too-distant future, as temperatures continue to rise across the West, we’re likely to see years like this a lot more often,” Kenward said.The report cites wildfire drivers not related to climate change, but say the warmer, earlier springs and longer summers “make conditions ripe for larger and more numerous fires,” according to the study.The study, which provides a sobering outlook for western states, found twice as many fires over 1,000 acres with an average of more than 100 per year from 2002 through 2011, compared with less than 50 during the 1970s.Summit County experienced an unseasonably warm summer with the average temperature for June through September at 79 degrees, topping the Dust Bowl-era record of 77 degrees set in 1934, according to information from the National Climatic Data Center.In Denver, residents experienced the hottest month on record with seven days over 100 degrees and 24 consecutive days with 90-degree temperatures or higher, according to The Denver Post.